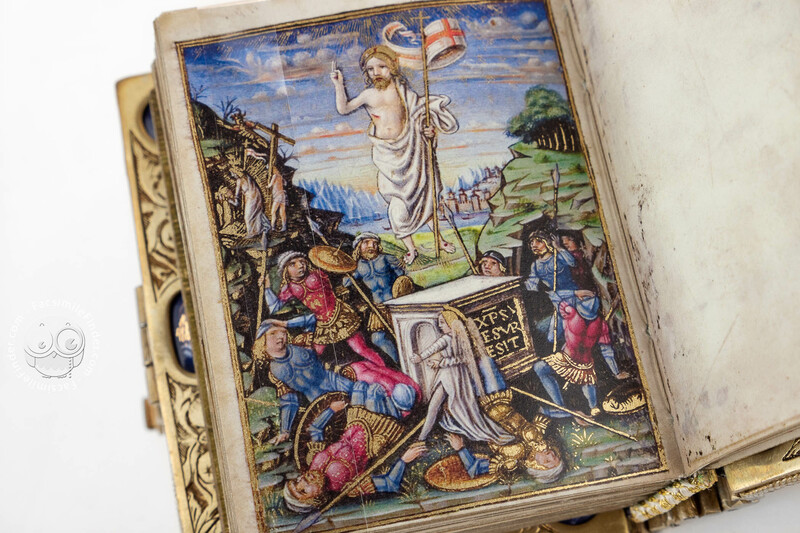 Very small in size, this extraordinary book of hours preserved at the Bibliothèque du Château, Chantilly, is a remarkable work because of the preciousness of its illuminations and binding. 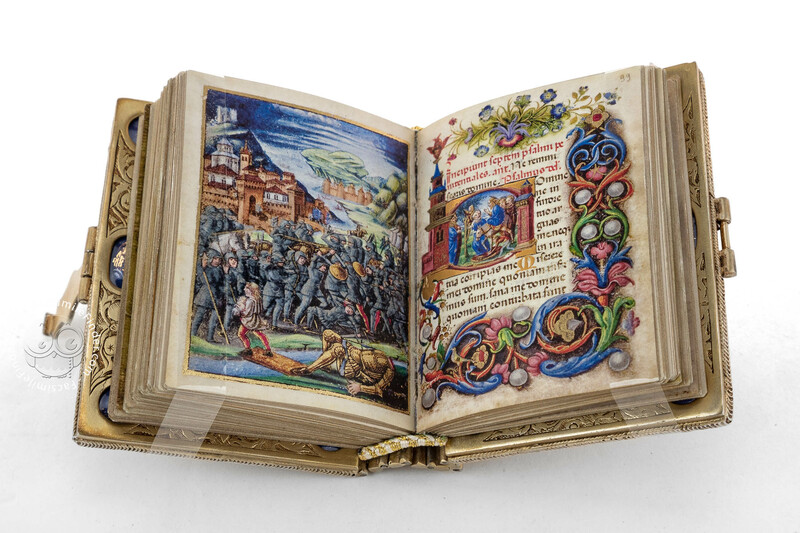 The codex represents a rare example of Italian production of books of hours. 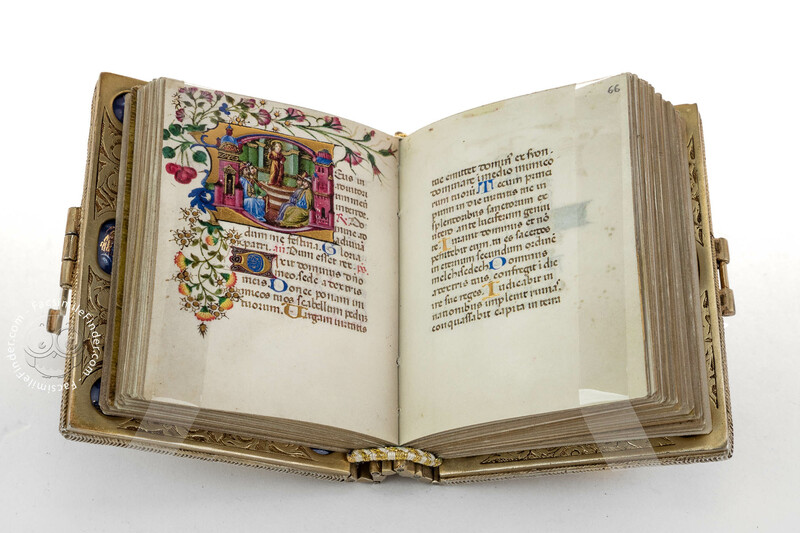 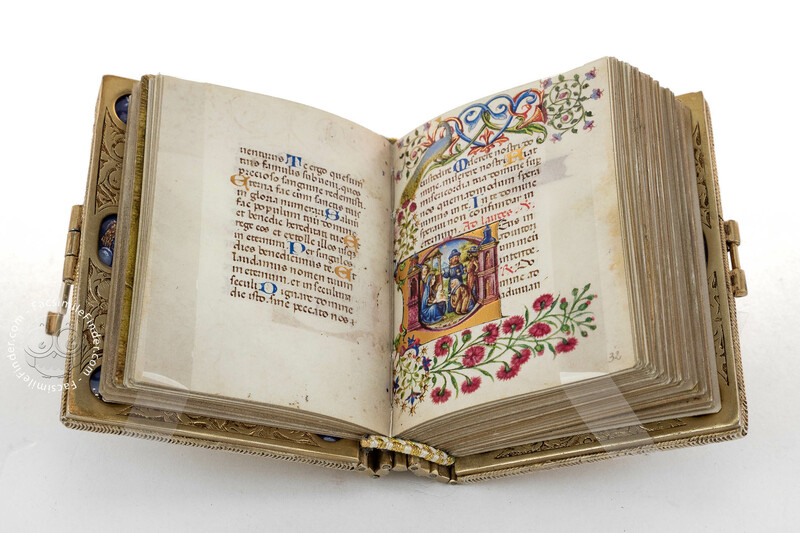 Thirty miniatures embellish the codex decorating the Calendar and the Offices of the Virgin; architectural, floral and foliate ornaments adorn the initials that mark the main sections of the book. 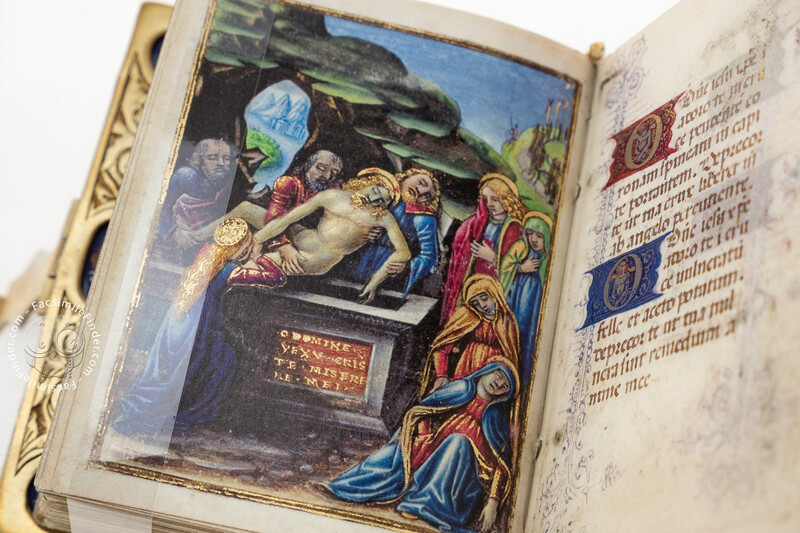 The illuminations of the Torriani Book of Hours have been attributed to the workshop of Giovanni Ambrogio de Predis, a painter from Milan known for being a collaborator of Leonardo da Vinci in the painting of the Virgin of the Rock. 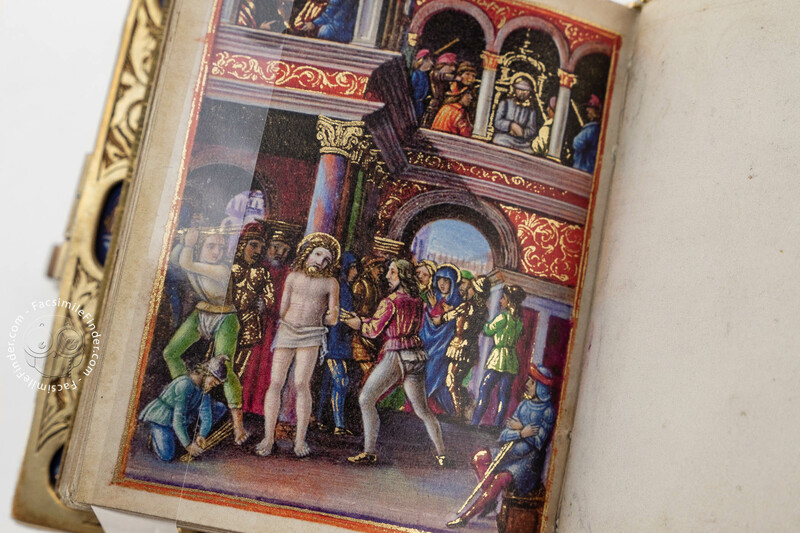 Ambrogio gained a reputation as a portraitist and illuminator for the court of Ludovico Sforza. 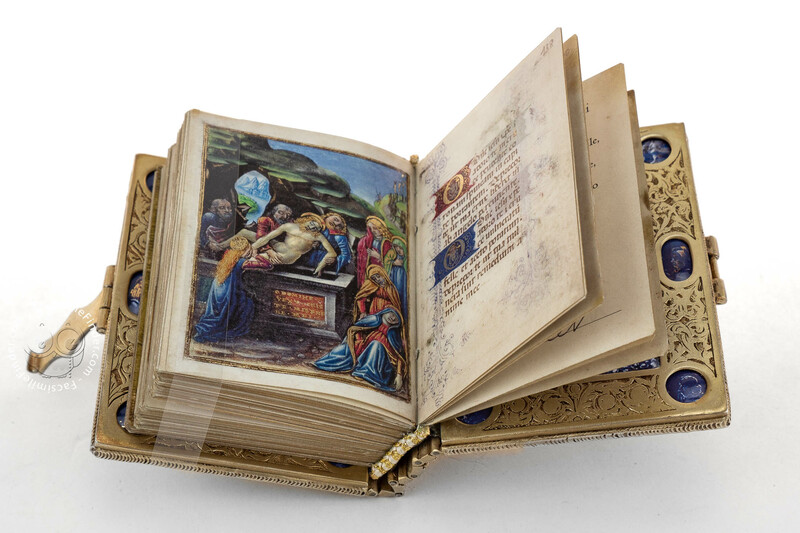 The leading workshop of De Predis was active at the close of the fifteenth century and was responsible for the decoration of this elegant Book of Hours. 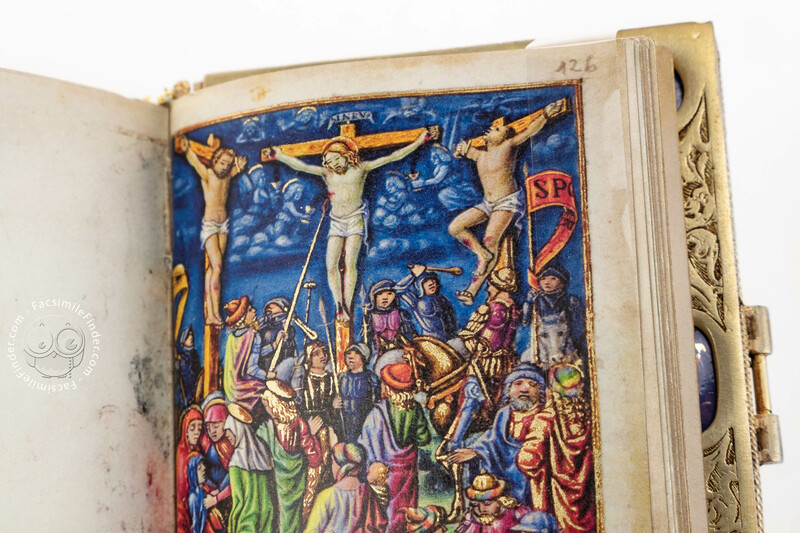 The full-page miniatures shine with intense colors and display dramatic scenes populated by many figures. 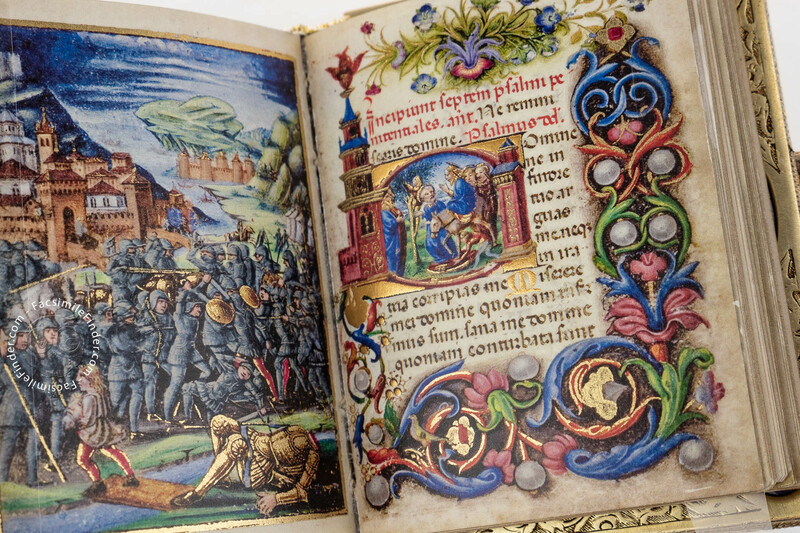 Matteo da Milano, one of the most important illuminators of Milan, painted the embellishments of the borders, with representations of animals, foliate motives, and jewels. 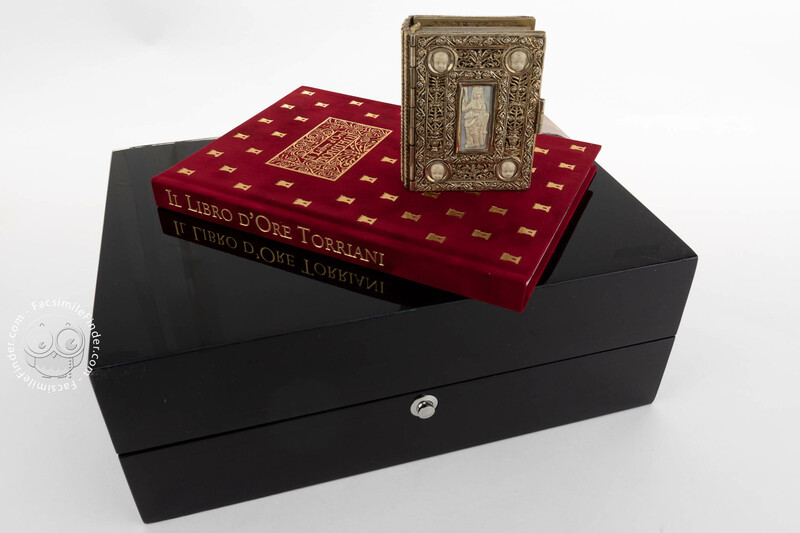 The Della Torre or Torriani family, an eminent family, which ruled over Milan for some time, commissioned this devotional manuscript. 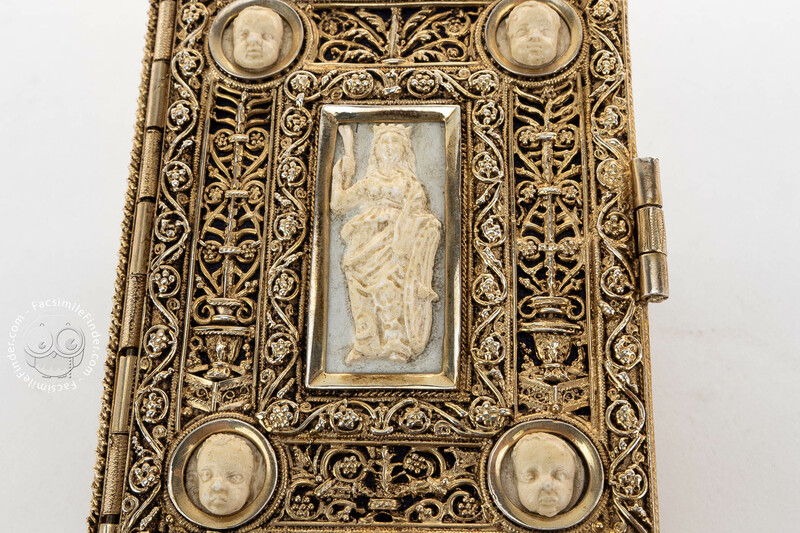 The Milanese connection of the codex is evidenced by the inclusion of local saints in the Calendar and the representation of Milan’s old cathedral, the church of Santa Maria Maggiore with the statue of the patron of Milan St. Ambrose on top of it. 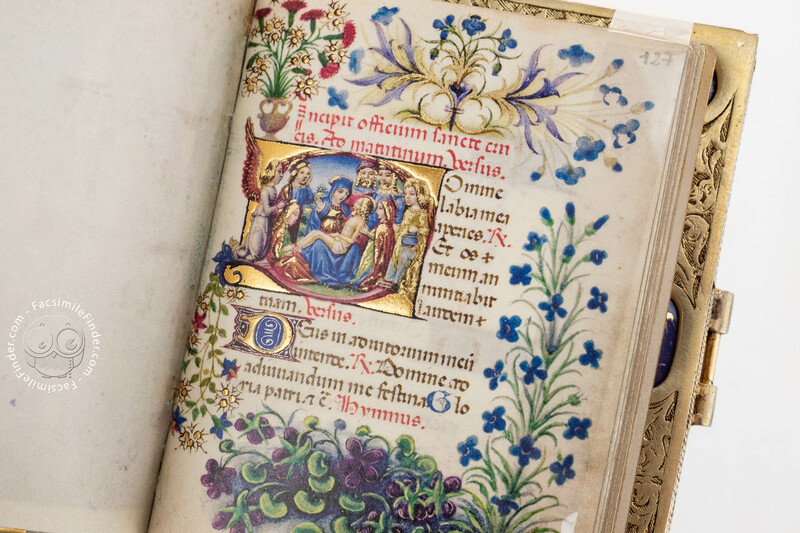 It has been suggested that the owner of the book was a woman at the court of Ludovico Sforza, however her identity remains a mystery. 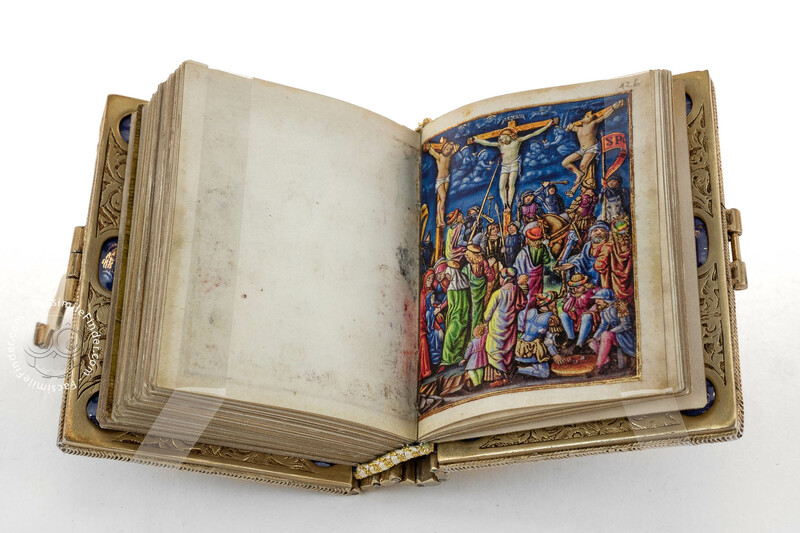 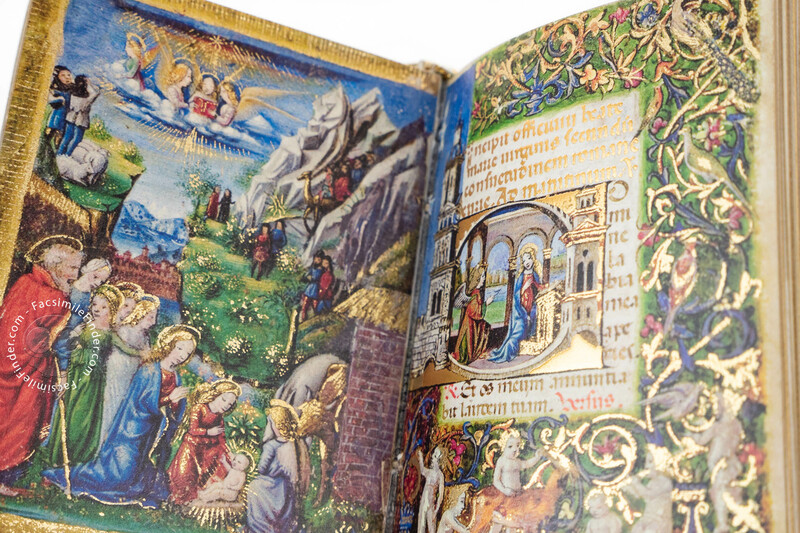 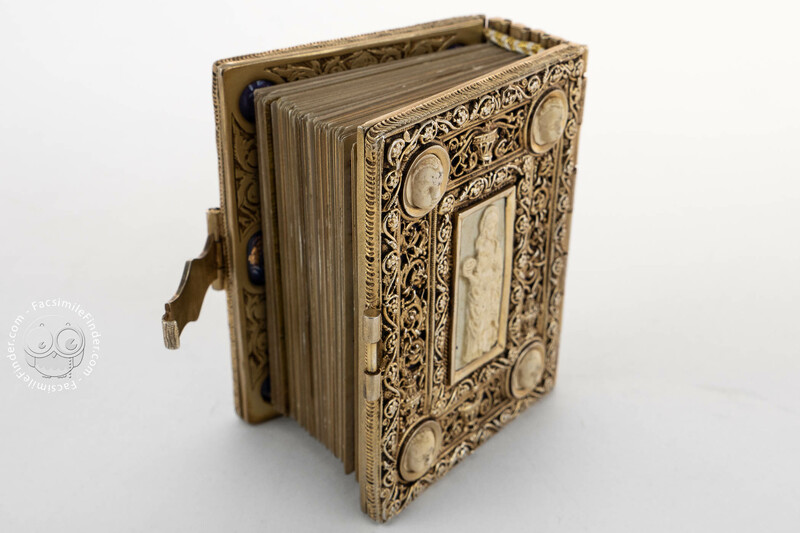 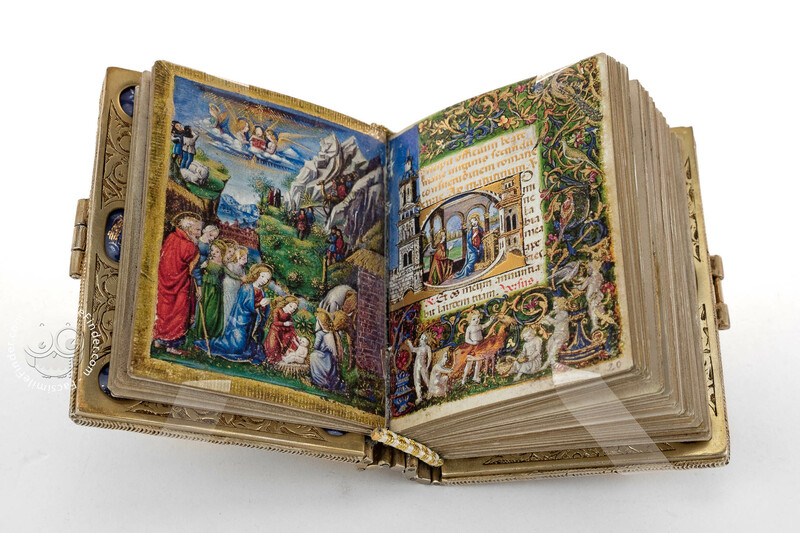 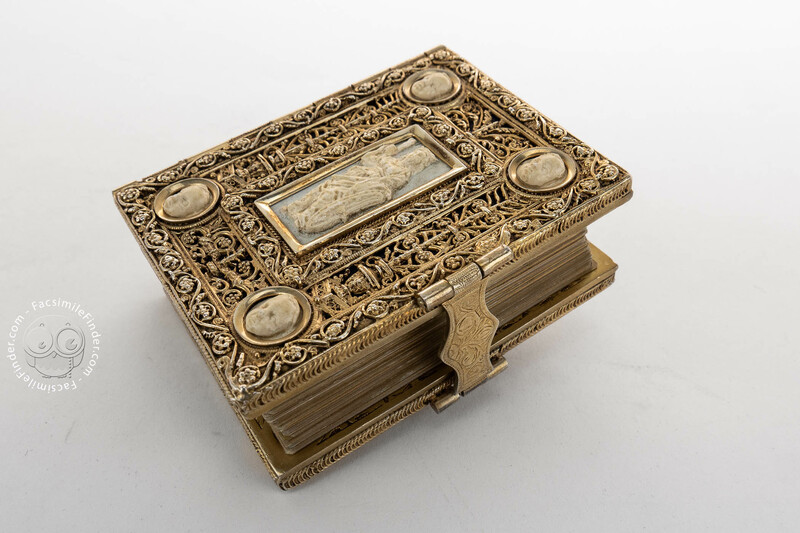 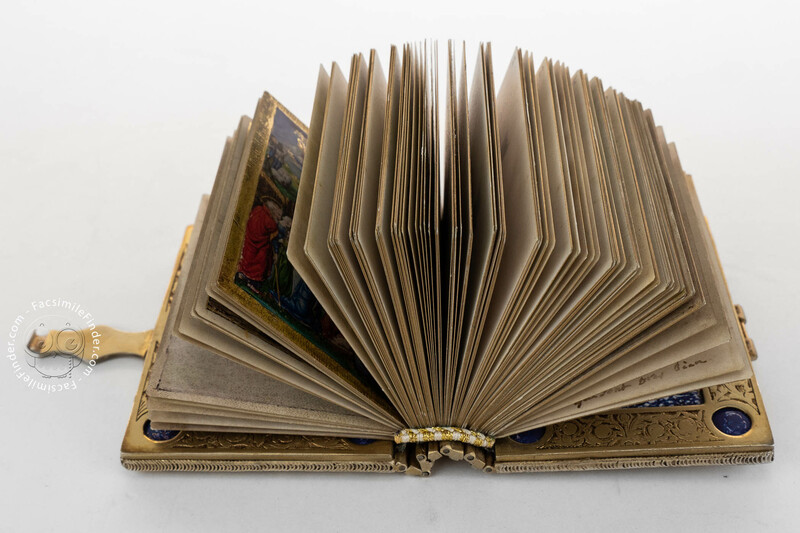 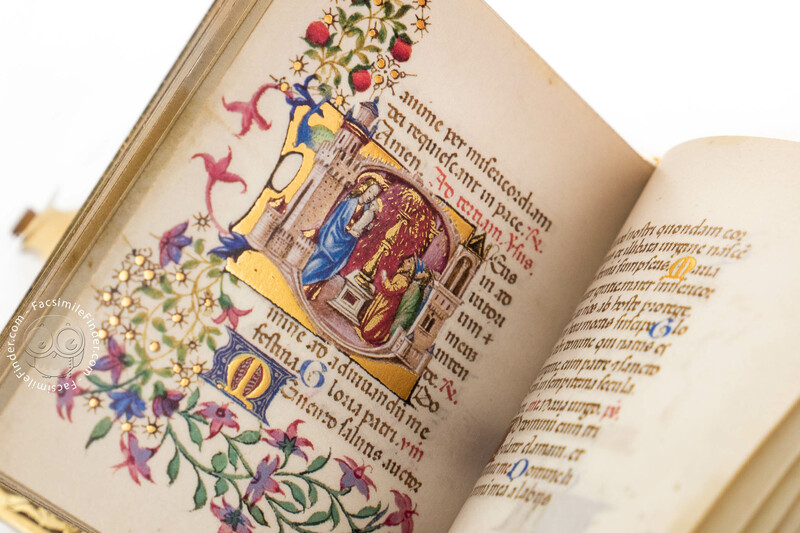 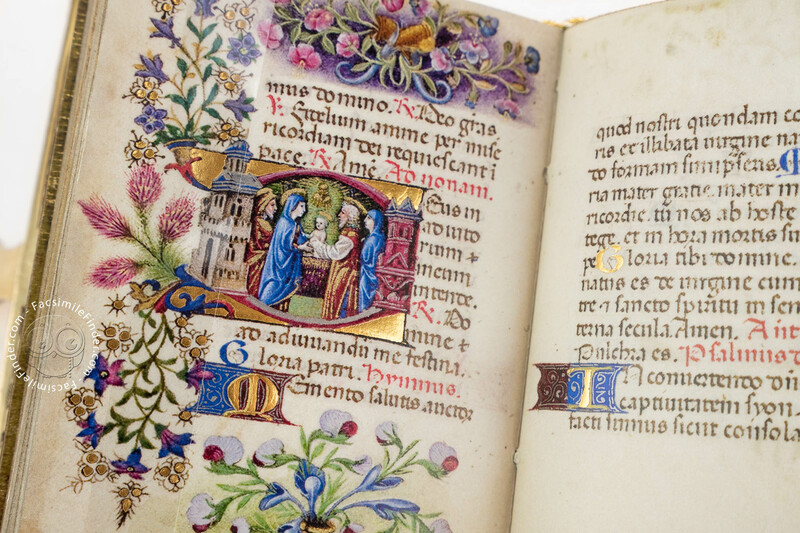 The Torriani Book of Hours still retains its original treasure binding. 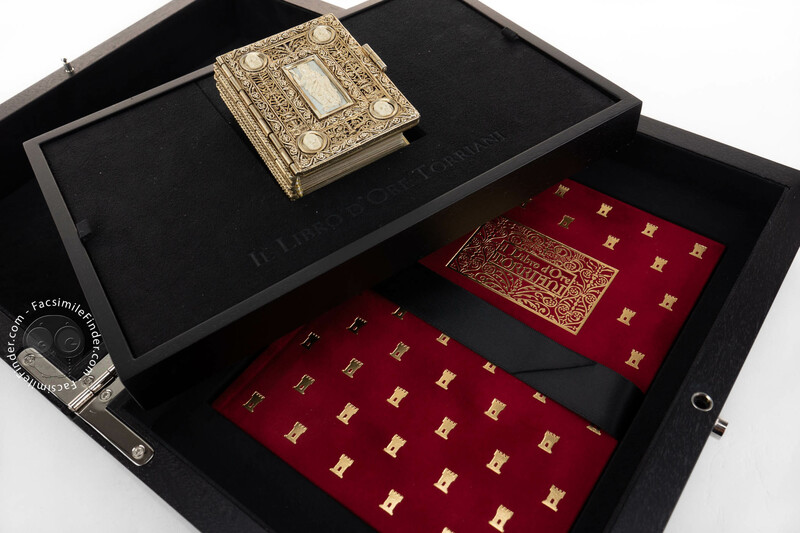 It is therefore an extremely rare codex. 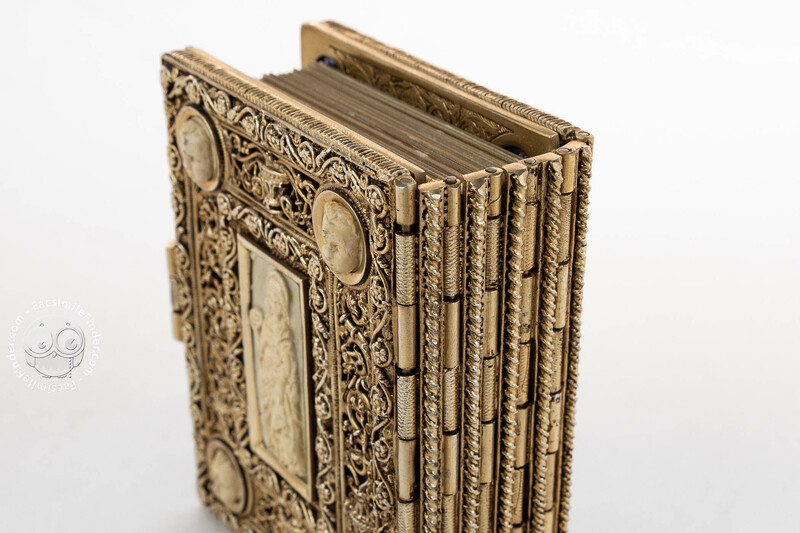 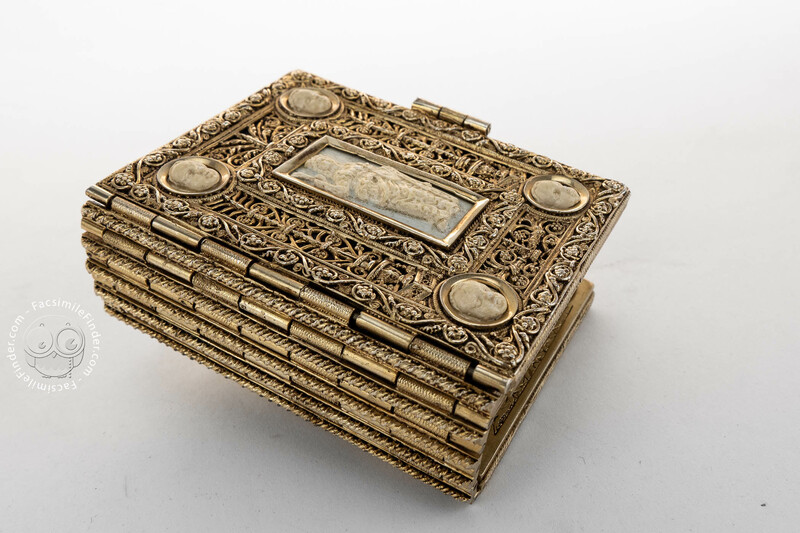 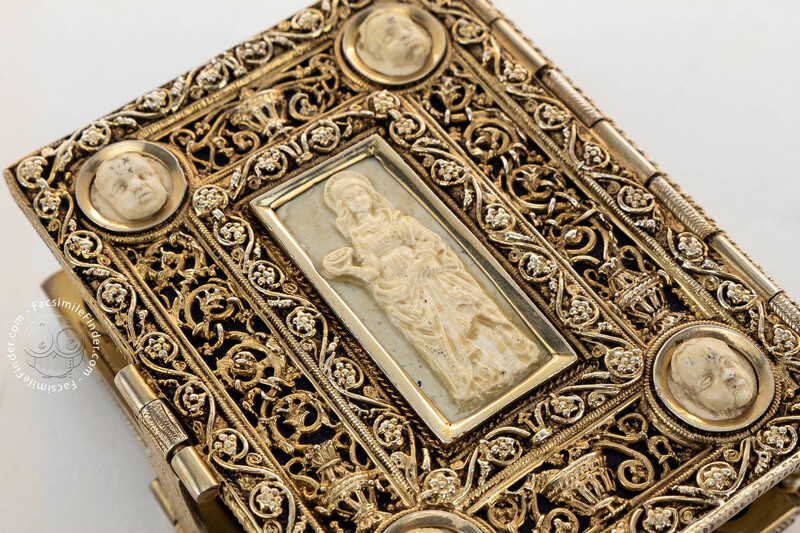 Gilded filigree work adorns the covers decorated with cameos featuring St. Caherine and St. Lucy. 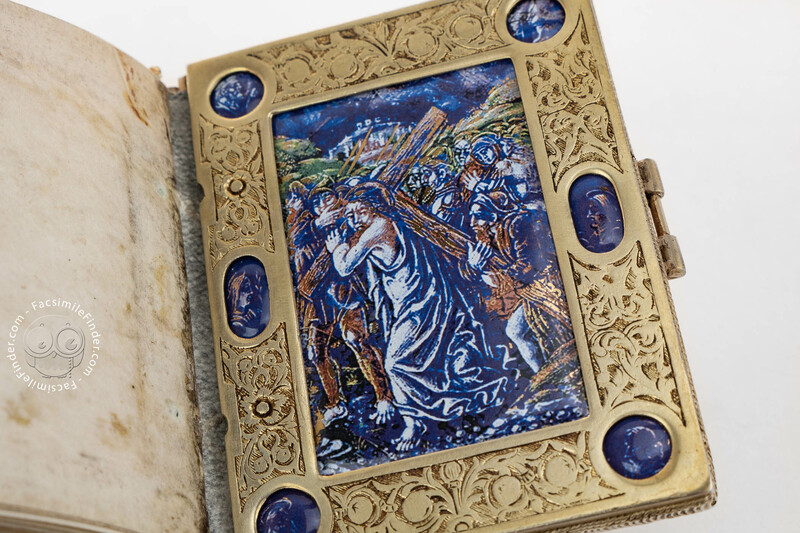 The inside covers exhibit rare enamel inlays representing the Kiss of Judas, the Way to Calvary, and twelve saints. 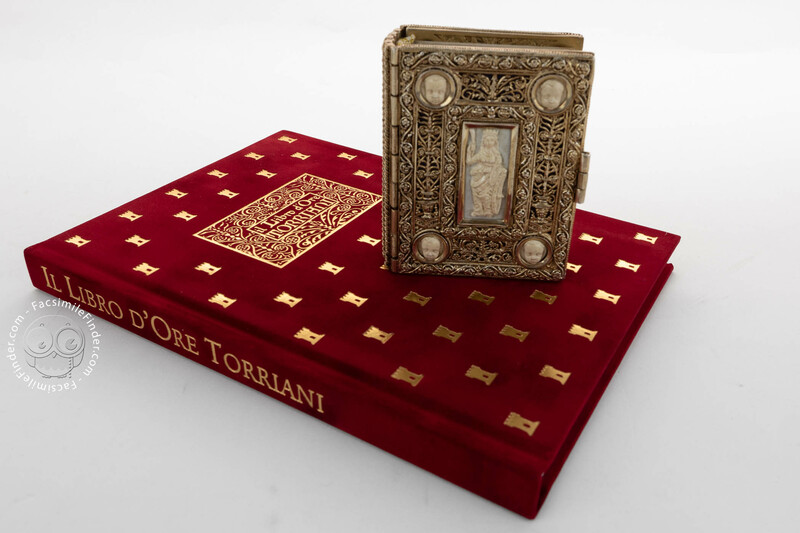 The binding of the Torriani Hours is representative of the wealth and refinement of goldsmith works produced by Milanese workshops during the reign of the Sforza. 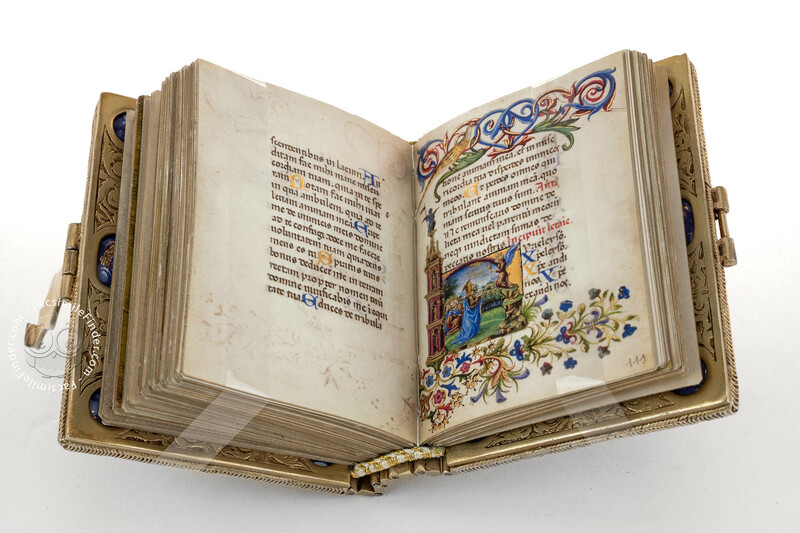 Manuscript book on parchment − 8.2 × 6.5 cm − 288 pp. Full-size color reproduction of the entire original document, Torriani Book of Hours: the facsimile attempts to replicate the look-and-feel and physical features of the original document; pages are trimmed according to the original format; the binding might not be consistent with the current document binding. 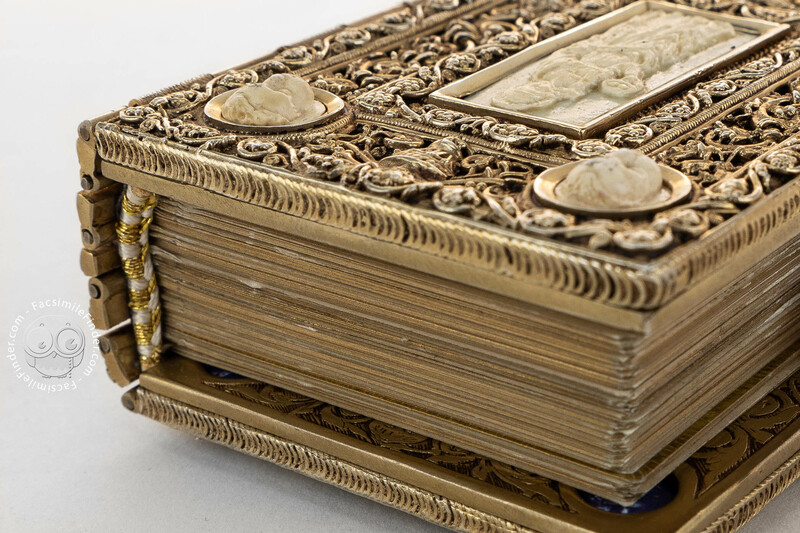 Bound by hand (gilded silver binding covers and spine).